Today marks the anniversary of what some would call "the mother of all demos," Engelbart's introduction of the NLS. Read about it and more in "This Day in Computer History", a chronology of notable events in the computer, ecommerce, and software industries on this day in history. 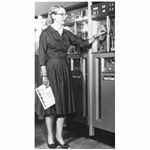 Future computer pioneer Grace Hopper was born in New York City. 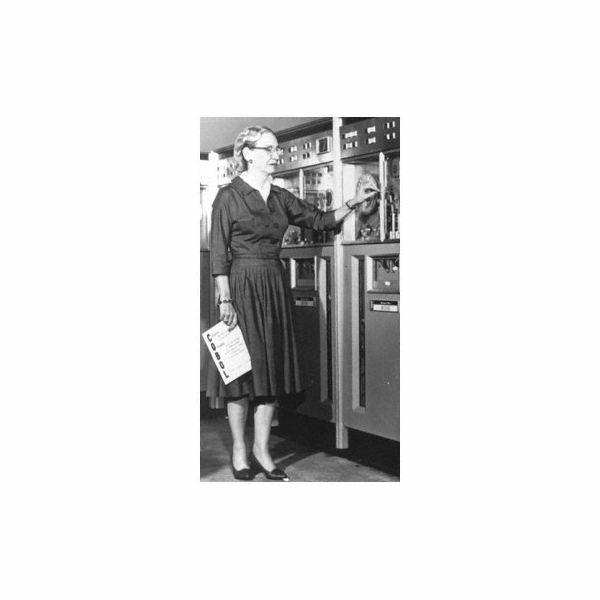 Not only was Hopper one of the first women in the computer industry, she would make significant contributions to the development of the Harvard Mark II and would develop the first compiler, A-0. Future cryptologist Irving John Jack Good is born in London, England. He would work on both the Enigma and Teleprinter encrypting machines at Bletchley Park. Sperry Rand introduced the Univac 1107, the first computer to employ thin-film memory. The magnetic memory technology was an iron-nickel alloy applied in a layer four-millionths of an inch thick on a series of glass plates to provide the Univac with its 128-word general register stack. At the San Francisco convention center, Douglas C. Engelbart of the Stanford Research Institute demonstrated the NLS ("oNLine System") to a thousand members of the American Federation of Information Processing Society via the first video teleconference in history. The ninety minute public demonstration introduced the world to a staggering number of ground-breaking technologies, including the computer mouse, dynamic web linking and hypertext, e-mail, graphical user interfaces for operating systems, object addressing, and the video teleconferencing technology underlying the entire presentation, as well as what would later be dubbed the the “paper paradigm," under which computer interfaces would be referred to by a series of metaphors likening the technology to a real-world office. The first self-replicating program to cause widespread real-world damage, the Christmas Virus, hit BITNET, causing mail servers across the nation to crash under the strain of excess network traffic. Microsoft released version 2.01 of its Windows operating system. The new version introduced overlapping windows and the ability to use the protected mode of Intel's 80286 processor. Price: $100. The High Performance Computing and Communication Act of 1991 was enacted. The act, which was sponsored by Senator Al Gore, would pave the way for widespread internet access in the U.S. by, among other things, creating a high-speed fiber optic network and funding the National Center for Supercomputing Applications, where the Mosaic Web browser would be developed. In the Fall of 1990, there were 313,000 computers online in the U.S. By the end of 1996, over 10 million users would be online, largely due to the bill. Microsoft released version 3.0 of its Internet Explorer web browser for Windows 3.1, the first version of the browser to developed independent of any Spyglass source code. It included several major technological advances, including Cascading Styles Sheets support, which was a first for any web browser. It also included support for the Platform for Internet Content Selection (PICS) system, Java applets, and ActiveX controls. The new features would make version 3.0 the first version of Internet Explorer to be widely distributed, and with the release, it would offer the first market competition to the market-dominating Netscape Navigator. Version 1.3 of the Unicos/mk operating system was released. Microsoft released BackOffice Server 4.0, which included: Exchange Server 5.5, FrontPage 98, IIS 4.0, Index Server 2.0, Proxy Server 2.0, SMS 1.2, SNA Server 4.0, SQL Server 6.5, Transaction Server 2.0, Visual InterDev 1.0, and Windows NT Server 4.0. The first digital cinema in the world opens in Hiroshima, Japan. It featured six screens, all digital projectors, and a system of film projectors as emergency back-ups. Jon Lech Johansen, known by the internet handle “DVD Jon," plead not guilty to charges of hacking brought by the Norwegian Økokrim, an organization devoted to prosecuting economic crimes, following a complaint filed by the Motion Picture Association (MPA) regarding Johansen's DeCSS DVD-decryption application. Yahoo! acquired the Del.icio.us social bookmarking service. Mozilla released version 3.0 of its Firefox web browser. Code-name: Gran Paradiso.